Within Rubens’ enormous output as a painter, which covered the principal pictorial genres (all of which he handled with equal skill), religious painting occupies a prominent position due to the number of works and their importance. Rubens painted large-scale religious compositions of a monumental and decorative type for public devotion in churches, as well as small-scale works intended for private devotional purposes. The present canvas falls within the latter category. The Virgin and Child with Saint Elizabeth and Saint John the Baptist dates from between two major commissions of this period: The Last Judgement, painted for the Jesuit church in Neuburg in 1616 (now in the Alte Pinakothek, Munich), and the so-called Coup de Lance of 1620, painted for the high altar of the Recollect church in Antwerp. During these years Rubens also undertook numerous private commissions, among them a number of Holy Family compositions, a motif that he painted throughout his career in many different ways. In the present case, Rubens once again looked to Italy, in particular to Raphael’s Holy Family known as “La perla” in the Museo del Prado. That work had been commissioned from Raphael by Ludovico de Canossa around 1518 and was acquired from his descendent, Galeazzo de Canossa in 1604 by Vincenzo Gonzaga, Duke of Mantua, a patron of Rubens’ during the artist’s Italian trip. According to Oldenburg, Rubens would have seen Raphael’s painting in the ducal palace in Mantua, and he used its composition not just for the present canvas but also for other Holy Family paintings. The pose of the infant Christ on his mother’s lap and that of the young Saint John are close to Raphael’s original. The theme of the Virgin and Child accompanied by Saint Elizabeth and the infant Saint John the Baptist was a motif depicted by Leonardo and one that Raphael made popular through his Holy Family compositions. As with numerous motifs in art, this episode is not recorded in the Bible, where the only meeting between Christ and John the Baptist takes place at Christ’s baptism in the Jordan. The origins of this motif are to be found in the Meditations of the Pseudo-Bonaventura in which this episode is said to have taken place during the Flight into Egypt. The subject and format of this canvas suggest that it was a private commission intended for domestic use. This is also likely to judge from the use of this agreeable, pleasant episode in which two children play under the watchful gaze of their mothers. The lamb on which Saint John is sitting, stroking its ear, is introduced as a symbol of Christ’s future sacrifice. This message is emphasized by the presence of the banner, whose white pennant refers to the Resurrection, resting on the lamb’s back. However, this aspect of the painting is not overtly stated and more emphasis is placed on the figures and the peaceful, happy mood. The solidly constructed principal group, with its full-length figures, is set in an exterior with a background of huge architectural elements of which only the base of a column and some of its stone blocks are visible. The compositional rhythm that skilfully links together all the elements once again reveals Rubens’ dynamic, vital style. The figures are modelled with warm colours using large brushstrokes that give life to the soft, pearly flesh tones that are highly typical of the artist’s style. 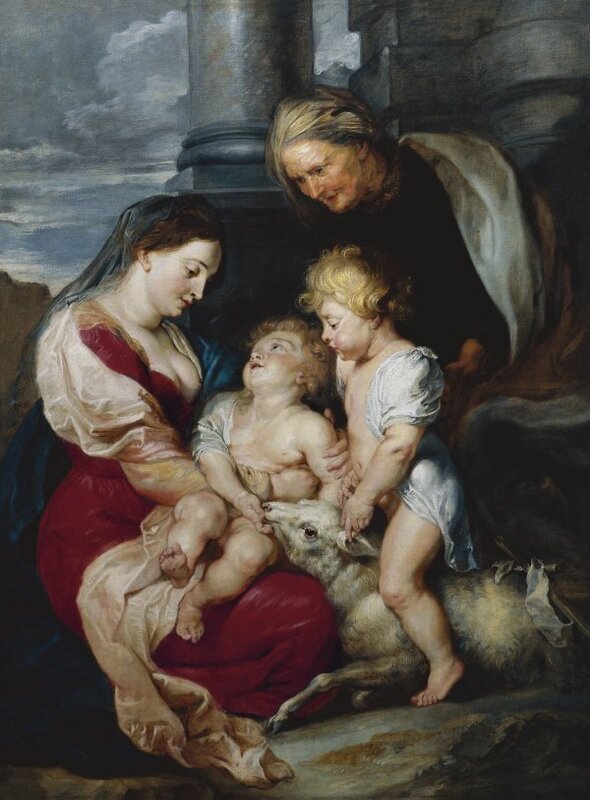 It has been suggested that the figure of Saint John straddling the docile lamb may have been based on Rubens’ own son Albert, who also modelled for other paintings by his father. 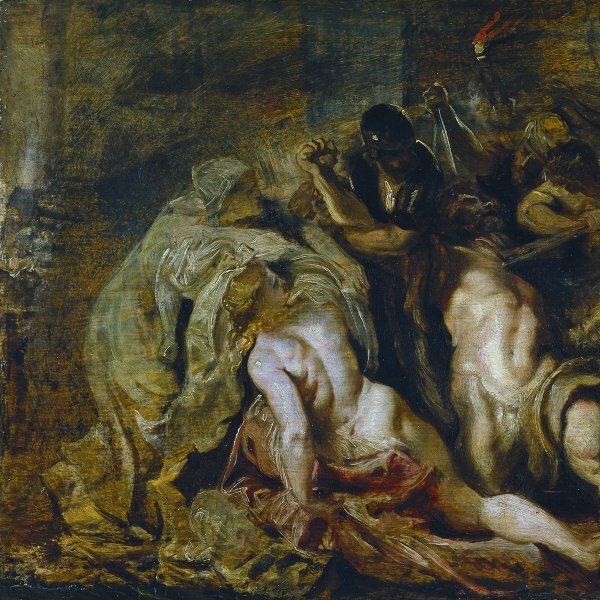 Gaskell recorded various versions of this composition, indicating its success among Rubens’ clients. Among them are the ones in the Palazzo Pitti in Florence, the church of Santa Maria del Giglio in Venice, three more in private collections and a copy in the Academy in Vienna. Two drawings have also been related to this composition in which the artist experiments with different arrangements of the figures, both in the Princeton University Art Museum. Between 1763 and 1935 the painting belonged to the Lowther family in Cumberland, while an old source describes it as belonging prior to that to the Gobou family in Antwerp, for whom it was supposedly painted. The canvas was acquired for the Collection from the Mercuria gallery in Lucerne in July 1935.